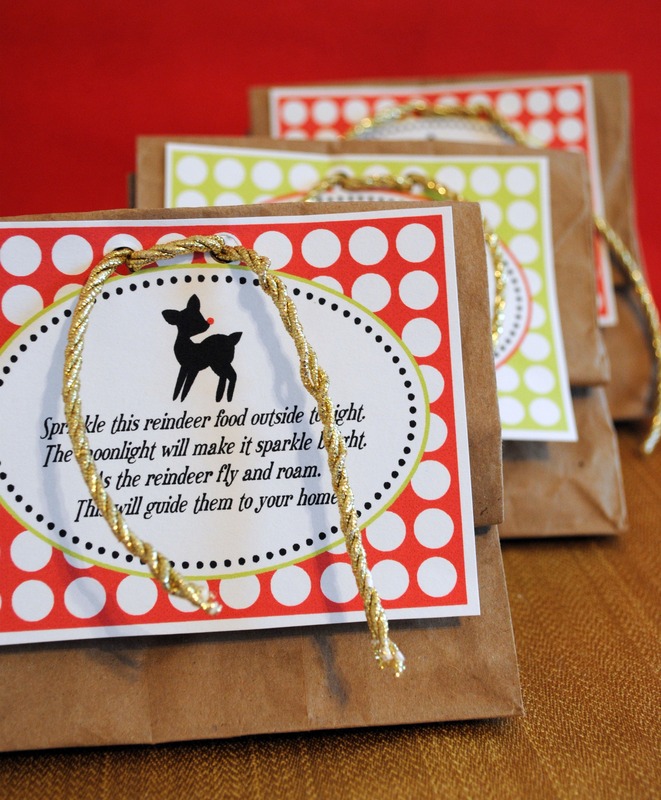 This reindeer food has been a sweet tradition in our family since my little one was around 2. I have some of the sweetest pictures of him in his PJ’s and boots sprinkling this on our lawn. In our house we don’t make it together though. Since the beginning one of Santa’s elves delivers a special bag sometime on Christmas Eve. It’s an adventure because it usually just shows up somewhere in out house and my son is always so surprised when he stumbles across it. If you’ve never heard of reindeer food before let me fill you in. The story goes that it is sent from Santa’s barn. On Christmas Eve you sprinkle it onto your lawn. Since it’s the special food the Reindeer eat they will see it and smell it, which will lead them straight to your house. I love things that add just a little more magic and wonder to the Christmas season for our children. This year I have a couple of friends who’s sweet littles stay with me several days a week. I thought it would be nice if they had some reindeer food for Christmas Eve as well. I don’t have a real recipe for this. It’s sort of a use whatcha’ got kind of thing. This year I used quick cooking oats. In the past I’ve used scratch feed for chickens, grape nuts, deer corn…..you get the point. Don’t stress, just be creative. 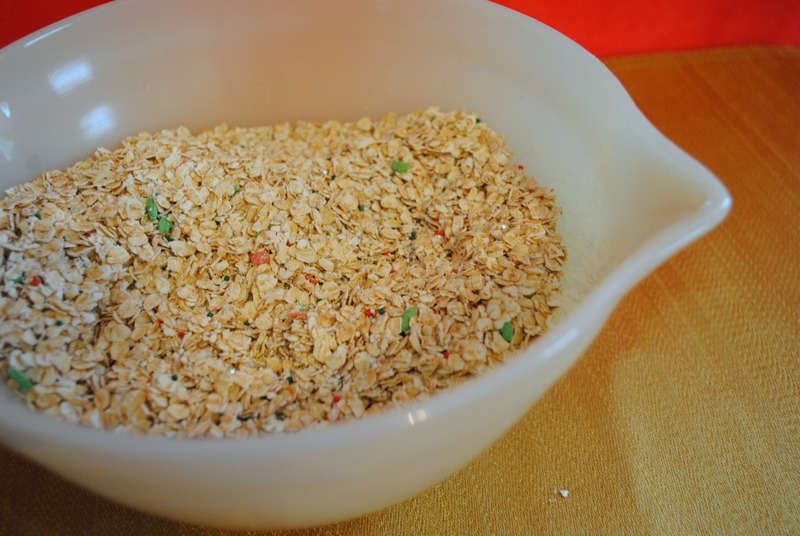 To make just pour your oats (or whatever you are using into a bowl). Use your own judgement here depending on how many children you will be making this for. Next mix in some cute Christmas sprinkles or red/green/silver/gold colored sanding sugars. I added in some glitter for extra sparkle. You can skip this step if you are worried about the wildlife in your area ingesting the glitter. I always package in small brown paper bags. It’s coming from Santas barn and I guess I just picture that as a pretty rustic place, so the packaging should match. 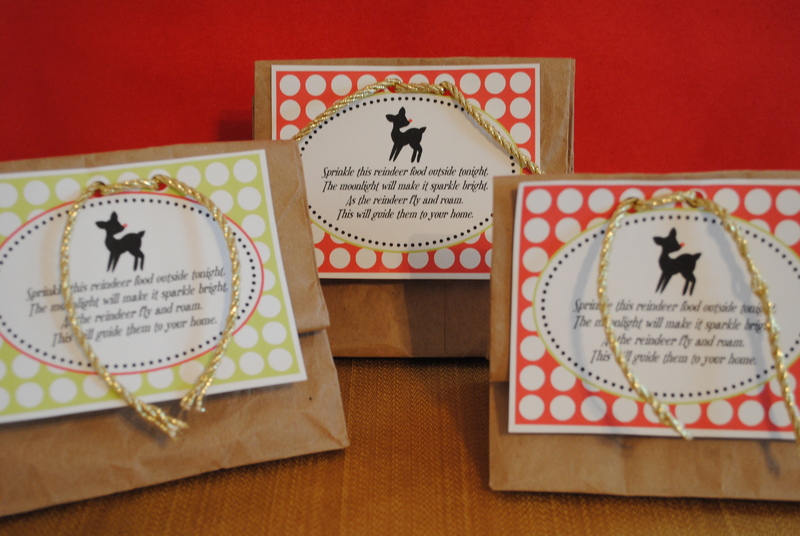 I found these super cute little tags over at The TomKat Studio. It’s a free printable download. Be sure to browse around while you are there. Her stuff is a-maz-ing!! This is one of my favorite Christmas traditions. What traditions does your family have?